xSidebarTIG ports the Firefox sidebar to Thunderbird. After installation there will be a sidebar in the Messenger, ViewMessage, and MessageCompose windows. These sidebars can be toggled open and closed with the F9 key, or from the View —> Sidebar menu. 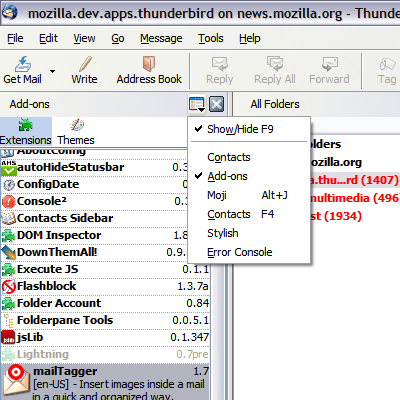 Once installed, Firefox sidebar extensions that use the Firefox API can be made to work in Thunderbird. Compatibility: Thunderbird 3.0 to Thunderbird 7. It will probably work in Thunderbird trunk builds but it's untested in this environment. Added sv-SE locale from Babelzilla. Fixed minor bug in the Contacts Sidebar overlay. Minimum supported version is now Thunderbird 3.0. Compact styles for the addons sidebar updated for Thunderbird 3.0 and 3.1. [fix] Fix session history error in browser.xml (disable history in our sidebar browser element). [fix] Theme splitter not oriented vertical in TB >= 2.0. [new] Added da-DK, pl-PL, sr-RS, and zh-CN locales from Babelzilla. [enh] Better support for tabmail UI in TB3.0b3. [fix] Sidebar splitter not totally hidden on Thunderbrird startup. [fix] Nesting error which showed the splitter but not the persisted sidebar on application startup. [fix] xSidebar bug 17854 - xSidebar for Tb problem persisting visiblity on restart. [new] Added ca-AD and pt-BR locales from Babelzilla. [new] Added tr-TR, and uk-UA locales from Babelzilla. [new] Added cs-CZ, mk-MK and ru-RU locales from Babelzilla. [fix] xSidebarTIG broken on Shredder 3.0b1. Updated addon sidebar styles for Shredder 3.0b1. [fix] Sending from contacts sidebar fails if no message folder is focused/loaded. [updated] Adapt more slim styles from userstyles.org for the Add-ons sidebar. [new] When the contacts sidebar is in messenger, hide non functioning context menu items and buttons. [new] When the contacts sidebar is in messenger, add context menu items to open the compose window with the highlighted address in the to, cc, or bcc field. [fix] fixed bustage on trunk due to the landing of the tabbed interface. [new] Added latest Babelzilla translations. [fix] For *nix platforms change the toggleSidebar hotkey from F9 to F4. [new] Added a toolbarbutton for the Contacts sidebar. [fix] Fix load, unload and js errors in abContactsPanel. [new] Added sidebar-picker toolbar button to the sidebar. [new] Override Contacts Sidebar in message compose window. [fix] Improve compatibility with Contactssidebar Extension. [New] Extension and Theme managers (Thunderbird 1.5), and Addons manager (Thunderbird 2.0) in the sidebar. Based on the xSidebar code contributed to the sidebar in Moji 0.9a3.